Stylish and practical, this computer desk from Monarch Specialties is a terrific focal point for any contemporary office. Its stylish white finish brings a touch of flair to any room or office. Its sturdy manufactured wood frame provides your work space with support and lasting durability. Keep it compact and organized with this desk, and still have enough room to store a computer, notebooks, and more. This Monarch Specialties computer desk will be a stunning focal point in your contemporary home office. This stylish piece features thick panels and clear lines accented in a brown finish. The manufactured wood material will offer sturdy and reliable support for years to come. Your workspace will be compact and organized with this desk, which has enough space for a computer, notebooks, and more. This contemporary two tone industrial look computer desk is the perfect combination of function, durability and design in a modern form. With clean lines, a chic white surface area and a sleek silver metal frame, this desk will add pizzazz to any home office or dorm room. The desk top provides ample surface area for a lamp, laptop or tablet while the drawer provides hidden storage for all of your additional office supplies. The perfect desk for small spaces! 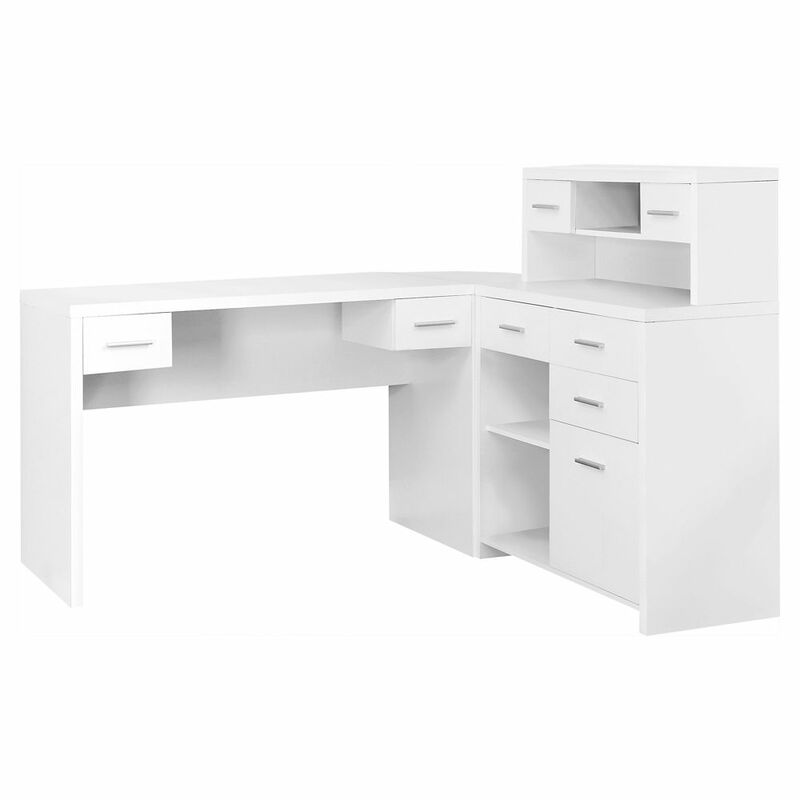 This contemporary style L-shape computer desk with a smooth white finish on all sides, features a deep drawer for office supplies, a closed storage cabinet, and two open fixed shelves for books, a small printer, or paperwork. Accented with sleek silver metal handles with a thick panel desk top provides enough room for a laptop or tablet, a lamp, or decorative object. Space saving, a modern design, and ample storage options make this the perfect sized desk for a student or home office. This sleek compact computer desk in a simple contemporary design adds style with functionality to your workspace. The smooth and spacious dark taupe faux wood-grain laminated surface made from quality MDF material provides plenty of room for a laptop, lamp, and other office essentials. The sleek and sturdy Z shaped black metal base gives that modern look. This desk easily compliments a student's room or any place you have carved out as your office and creative space. Quick to assemble, you'll have your work area set up in no time at all! 47-inch x 31-inch x 24-inch Corner Computer Desk in White Stylish and practical, this computer desk from Monarch Specialties is a terrific focal point for any contemporary office. Its stylish white finish brings a touch of flair to any room or office. Its sturdy manufactured wood frame provides your work space with support and lasting durability. Keep it compact and organized with this desk, and still have enough room to store a computer, notebooks, and more. 47-inch x 31-inch x 24-inch Corner Computer Desk in White is rated 4.0 out of 5 by 2. Rated 5 out of 5 by EP from Great Home Office Desk Very impressed with the quality of this product. Do recommend getting someone to put it together as there are a million pieces (though they are all numbered). Professionals can do it it less than an hour and some of the reviews I read prior to buying said it took days and lots of headaches. Desk offers plenty of storage and really looks great. Highly recommend for a home office with some sophistication! Is the desk length 47&quot; each way? What is the width and height of the hutch? Hello Corie, you may view the full dimensions for this desk unit here: http://monarchspec.com/PRODUCT_PHOTOS/LINEART_DRAWING/I 7028.jpg. The full length of the desk is 62.75 in (up to the corner piece) and the hutch side is 35.5&quot; L x 15.5 in. D. Thank you.